Chronic harvesting of a tropical tree that many local communities in Western Africa depend on can alter the tree's reproduction and drastically curtail fruit and seed yields over the tree's lifetime, according to a new study. The study, which appears this week in the Journal of Ecology, is the first of its kind to use what's called "age-from-stage" mathematical modeling, a way of estimating plant age from its size, to investigate how harvesting affects a plant's life expectancy and other life history traits, such as age at maturity. In this case, the tree Khaya senegalensis, commonly known as African mahogany, is found in many habitats in Western Africa, from forests to savanna woodland, and is considered a vulnerable species due to drought and logging. 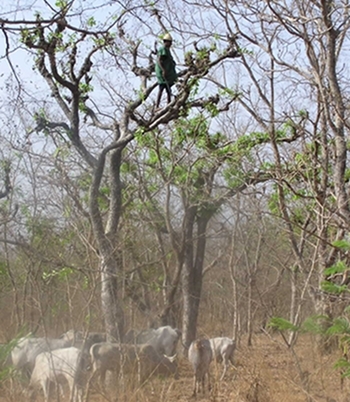 The tree is heavily harvested for its leaves, to feed cattle, and for its bark, which is used medicinally to treat many ailments, from stomachaches to reducing malaria fevers. Specifically analyzing harvesting effects on the tree in both dry and moist regions in Benin, the study found that plant harvesting affects life history in different ways depending on the climatic conditions. In the moist region, chronic harvest delayed reproduction and the trees lived longer, whereas in the dry region, chronic harvesting hastened reproduction and shortened the trees' life span. "For indigenous people who are harvesting these plants, knowing how long a particular species is going to persist or how soon it is going to reproduce is valuable information for planning and management, especially for plants for which fruits are harvested," said Orou Gaoue, the study's lead author and assistant professor of ecology, evolution and conservation biology at the University of Hawaii at Manoa. "As we consider how global warming may affect human livelihood and the resources we use, it is important to understand and account for the ways in which variation in climate and human behavior can change the traits or productivity of harvested wild plants," Gaoue added. "Here we found that if you fail to account for that variability, even in harvesters' behavior, you may underestimate the effect of harvesting on population life history traits." The study was completed when Gaoue was a postdoctoral fellow at the National Institute for Mathematical and Biological Synthesis.